← How many Cabinet members would have failed the trade union ballot test? 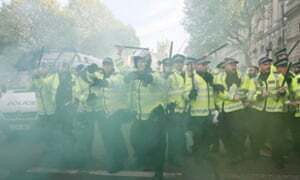 Police will be forced to adopt a “paramilitary” style of enforcement if the government inflicts big budget cuts on them, the head of the police officers’ organisation has warned. 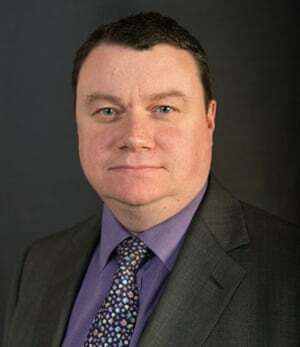 Steve White, chair of the Police Federation, said his 123,000 members, from police constables to inspectors, fear a move towards a more violent style of policing as they try to keep law and order with even fewer officers than now. White said cuts would see the bedrock principle of British law enforcement, policing by consent, ripped apart. The week ahead sees the federation stage its annual conference, which starts on Tuesday 19 May. 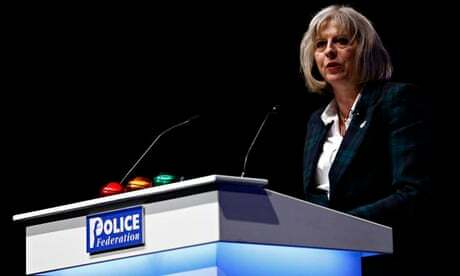 The key day will be Wednesday when the home secretary, Theresa May, will address rank-and-file officers. Last year May stunned delegates with a speech telling them to reform or be taken over by government, and telling them policing was failing too often. Police leaders have a fine line to walk in opposing cuts. Rank-and-file members are furious at the effects of austerity on their terms and conditions, as well as falling officer numbers nationally. But May and her advisers believe some members of the police force use over-the-top rhetoric in predictions that cuts would lead to chaos on the streets, and instead believe they should squeeze maximum value out of the public money given. White said police had already endured five years of austerity and were braced for more “swingeing cuts” after the election of a Conservative government with a majority. White said that since 2010, when the Conservative-led coalition started slashing its funding to police by 20%, the service had been cut by 17,000 officers and 17,000 civilian staff, but had managed to limit the effect on the public. He said the service was now “on its knees”, with some internal projections within policing of a further 20% to 25% of cuts by the end of the next parliament in 2020. This would lead to more than 15,000 officers disappearing off the streets, only being seen when responding to crime or serious events such as disorder on the streets. “You police by consent by having a relationship with local communities. “If you don’t have a relationship, because the officers have been cut, you will lose the consent which means the face and style of policing changes. After the Conservative election win, May was reappointed to the Home Office. The party’s manifesto promised further reforms to police. There is no sign theConservatives, emboldened by an electoral mandate, will reduce the size of cuts in government funding the police face. He said crucial parts of policing which help prevent crime are under threat, including prevention, reassurance patrols and neighbourhood policing. “The police officers we represent are telling is, day in and day out, that they are close to being on their knees,”the Federation chair said. The burgeoning stress on officers has led to increased mental health problems, increased sick leave and plunging morale, he claimed. Some chiefs have talked privately about cuts so large their forces are reduced to 1980s-style policing, responding to crises only, with heavy cuts to prevention and building relationships with communities. West Midlands police is planning ending the bobby on the beat in some areas, and expects its funding from government to be cut by 40% by 2020, compared to the money it received from central government in 2010. Unlike the National Health Service, policing was not protected from cuts. The Conservatives point to the fact that official figures show crime has fallen, while police numbers have been cut and the service reformed. The Conservative manifesto for the general election pledged to “finish the job of police reform”, vowing that would boost confidence in the police. On Thursday Britain’s top counter-terrorism officer, assistant commissioner Mark Rowley, said he would fight for police to be kept on the beat, amid fears budget cuts will see fewer officers gathering potentially crucial intelligence needed to thwart a growing tide of terrorism. Rowley said he would stress in upcoming budget talks the “essential” role played by uniformed officers in neighbourhood teams. White won the top job in the embattled Police Federation last year on a promise to reform the organisation whose reputation had been tarnished. He beat his rival on the toss of a coin after the committee supposed to make the decision was evenly split. This entry was posted in Police and tagged austerity, Conservatives, Home Office, Police, Police Federation, Steve White, Theresa May. Bookmark the permalink. The Police had a change to their pension system that now gives a less works pension. They too will be hit by the flat rate state pension that reduces or wipes out the state pension on top of reducing Police pensions from the SERPs opt out, that was mostly done to public sector workers, that means for each year contracted out, you lose a 1 year National Insurance record. As SERPs began on 6 April 1978 and the opt out began the same day, then there is the extreme event like me where all my service was opted out. Most of the Police Officer who began in the 1970s are long gone with the 30 year rule for retirement at 55. The Police numbers have been cut, as have Police civilians from the swingeing austerity job cuts. Those Police that are left are not actually police, but the Police Community Support Officer who are employed Police civilians, not the Crown servants that a regular Police Officer is. Huge swathes of tasks are now done by volunteers. In another blog, an eviction of squatting protestors in a bank, were done with the help of the Fire and Rescue Service – firemen – having their time wasted on policing work, instead of being ready to attend a fire. They too, as public sector workers, will be victims of the SERPs opt out being merged with National Insurance record by the flat rate state pension law. That effects works and private pensions as well. as low as £38 per week after 45 years in work. 10 years or less National Insurance history. of £3.87 per week for those retiring on and after 6 April 2016. So say, 45 years, opted out for 20 years, means only 15 years NI record. The full flat rate state pension needs 35 years NI record and 35 years not contracted out of SERPs. So the wiping out of the state pension and effect upon works and private pensions will hit Police officers, PCSOs (the plastic bobbies, so nicknamed) and Police Civilians equally. The Police already have a petition at their reduced works pension.